Today’s recipe is a guest post from the lovely Jaime of the gorgeous blog, Sophistimom. If you have not checked out her blog, do so! It’s fabulous and so is she! She is a mom and is all about bringing sophistication into the lives of her three children through great books and food. Follow Jaime on Twitter! Oddly enough, Jaime and I both adapted Martha Stewart recipes for our guest posts, so be sure to head over to her blog to check out my post for Snickerdoodle Cupcakes with Vanilla Bean Cream Cheese Frosting. They are delicious! I gained five pounds from this baby. I must confess, that though this recipe was my own, I borrowed heavily from the pages of my favorite issue of Martha Stewart Living issue (June 1999). How could I not love it, with recipes like Savory Black Eyed Pea Pie and Cinnamon-Sugar Waffles? That was the issue that hooked me on Martha’s whole franchise. Everyone has heard that she’s ornery behind the camera. And I’m no dummy — I’d rather be her friend than her enemy. But I will love Martha Stewart, her creations, and her whole team of workers ‘til the day I die. I could not turn my back on someone whose work and talents have brought me so much joy and inspiration over the years. This peach blackberry crumble tart was adapted from the June 1999 Dessert of the Month: Raspberry-Plum Crumb Tart. It was so delicious, and I have made it so many times, that I thought it would be fun to change it up some and create my own version. 1. Preheat oven to 350°F (180°C). Butter the insides of a 9 inch spring-form pan. Oh my goodness,.. this tart is fierce, FIERCE! Wowee! 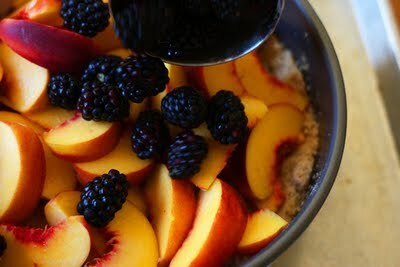 I keep seeing more fabulous dessert treats made with both peaches and blackberries; what a fabulous creation! What a stellar dessert! Perfect for a hot summer day! 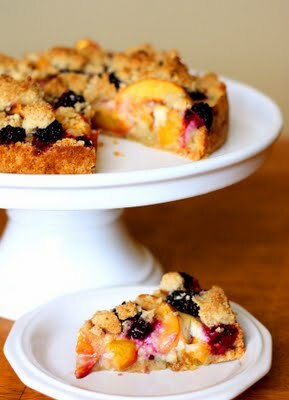 peaches,blackberries and crumbles…can't get any better than that! Lasagna tart, Crumble tart….serious creativity going around the foodie blogosphere! Looks lovely! Wow those peaches look amazing! Love all the colors! Hi, Jamie! Lovely photo! This is right up my alley…I'm lovin blackberries right now! Yummy, I want to try this! Can I get almond flour in any grocery store? Or do I need to go to a specialty store??? Just excellent! What an absolutely divine tart! I ♥ fruit in baking & this is PERFECT!! Oh yum, that sounds terrific and it's gorgeous! Can't wait to head over to Jaime's site to see your cupcakes! What a great way to use those summertime fruits. I love peach and blackberry together! yum! Id love this topped with some ice cream.. it looks fabulous! Oh my gosh, that looks simply gorgeous! I've just made this for my grandad's birthday, and it is amazing! I had been looking for the perfect peach recipe to use up some of the peaches that have been hanging around the house, and this certainly did it for me. 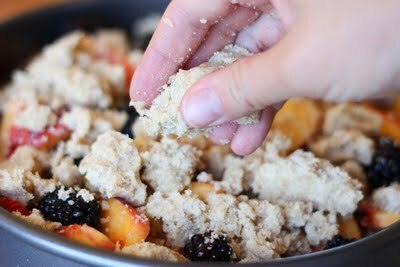 The combination of fruits is great, and the crumble gives it that little extra something. Oh that looks delicious, very colorful too! I’ve never seen this fruit combination and it looks awesome. Peaches are my favourite fruit. Yum! help! im making this right now and it doesnt say when to add heavy cream and milk. im assuming at any point during making the custard? also, will it get thick or no? I replied to you via email. Simply add the cream with step 4, I apologize for the error!